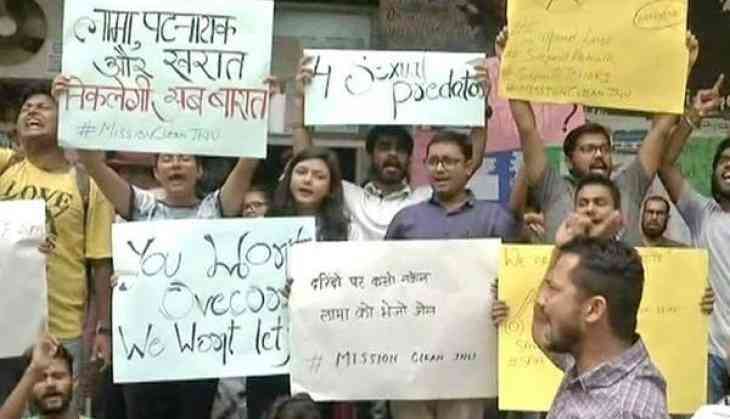 Students of Jawaharlal Nehru University (JNU) staged a protest against professors Mahendra P Lama, and Rajesh Kharat leveling allegations of sexual harassment against them. The students demanded that they should be arrested. Recently, JNU's another professor Atul Johri was arrested in a sexual harassment case and was later granted bail. A student of JNU filed a case against Lama and Kharat, who work in the Centre of South Asian Studies of JNU. The professors allegedly took the student to China for work and tried to harass her sexually. She asked the Internal Complaint Committee of JNU to suspend the professor. However, no step has been taken against him as yet. Both the professors were arrested by the Police on the basis of the complaint registered by the victim but were later granted bail. The varsity authority has not taken any action against them since then.